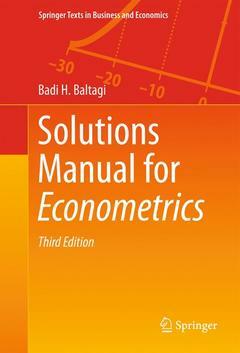 Solutions Manual for Econometrics Baltagi Badi H.
Auteur : Baltagi Badi H.
This Third Edition updates the "Solutions Manual for Econometrics" to match the Fifth Edition of the Econometrics textbook. It adds problems and solutions using latest software versions of Stata and EViews. Special features include empirical examples using EViews and Stata. The book offers rigorous proofs and treatment of difficult econometrics concepts in a simple and clear way, and it provides the reader with both applied and theoretical econometrics problems along with their solutions. What Is Econometrics?.- A Review of Some Basic Statistical Concepts.- Simple Linear Regression.- Multiple Regression Analysis.- Violations of the Classical Assumptions.- Distributed Lags and Dynamic Models.- The General Linear Model: The Basics.- Regression Diagnostics and Specification Tests.- Generalized Least Squares.- Seemingly Unrelated Regressions.- Simultaneous Equations Model.- Pooling Time-Series of Cross-Section Data.- Limited Dependent Variables.- Time-Series Analysis. Badi H. Baltagi is distinguished Professor of Economics and Senior Research Associate at the Center for Policy Research, Syracuse University. He received his Ph.D. in Economics at the University of Pennsylvania in 1979. Before joining Syracuse University, he served on the faculty at the University of Houston and Texas A & M University. He is a fellow of the Journal of Econometrics and a recipient of the Multa and Plura Scripsit Awards from Econometric Theory.